The new PB Series from SPX Flow Hydraulic Technologies has increased portability, longer run-time, larger valve selection and remote “plug-play” control options. 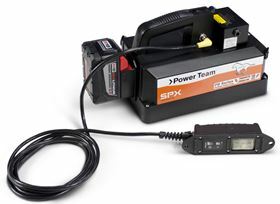 SPX FLOW Hydraulic Technologies has broadened its hydraulic power pump range with the addition of the PB Series cordless hydraulic battery pumps to its portfolio. The new PB Series pump has been engineered to meet market demand with increased portability, longer run-time, larger valve selection and remote “plug-play” control options. Powered by a Li-Ion 18VDC 9.0 Ah battery pack, it features a two-stage, compact high-pressure hydraulic pump. A self-contained, rubber bladder reservoir enables pump usage in many positions with a capacity of 1.1 litres usable oil. The 18VDC motor and other components are housed inside a high impact plastic, fiberglass reinforced casing to protect it in some of the most demanding and harsh applications. The pump weighs only 11kg, making it easier to handle in small spaces and remote applications.